The film (above) follows six of the most well-known mermaids found in ancient Greek and Mesopotamian myths. Photos (below) taken simultaneously during filming document their lives and the worlds they live in. Music made by Orestes de la Paz designed it by playing the film from beginning to end while recording a single instrument. He did this over and over and over again until he had created the full composition that best fit the voice of each mermaid. The original stories of mermaids were not tales of beautiful and sweet nymphs. They were sirens whose origins began as phoenix's in the sky, hand-maidens to Persephone. After failing to keep her safe from Hades because they were busy flirting with Icarus and his father, Persephone's mother, Demeter, ripped off their wings and cast them from the top of Mt.Olympus to the bottom of the sea. After their only true love, Icarus, flew too close to the sun in hopes to be able to fly with his beloved phoenix's he died on the rocks of the ocean in front of their eyes. From this moment was born their new primary motive in life; to beckon lonely sailors to their island and caves with their temptress songs and eat them, for these sailors would never know what love truly was like like their love with Icarus. Their claws would tear at their skin as they devoured the young sailor's hearts among their glorious jewels and silver platters gathered from sunken ship remains. "We were so heartbroken and sang til sailors were entranced by our song and lead them to their demise just as our love did that grief stricken day. So it has been and so it will be until, someday, the gods will take mercy on us and grant us death so that we can be reunited with our beloved at the bottom of the sea." 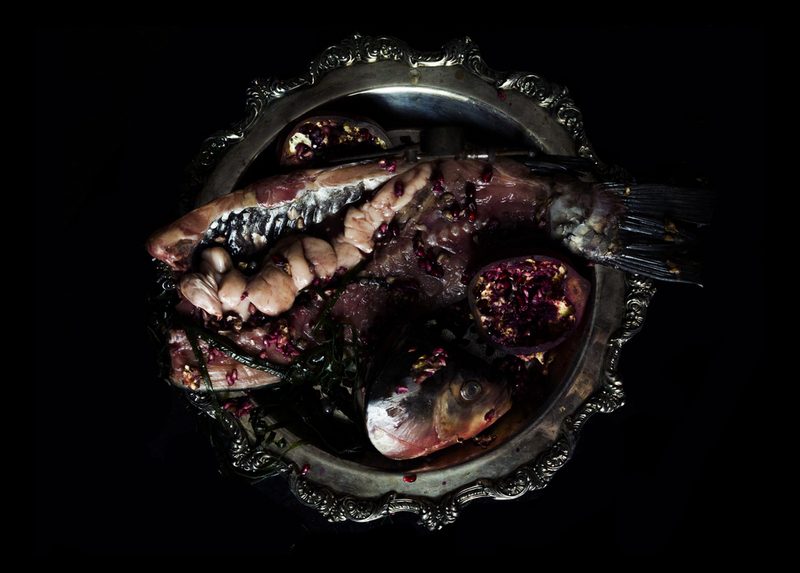 Created in 2015 simultaneously as a short film and photo still's, Mermaid Food features six sirens, Ligeia (The Shrill One), Parthenope (The Sweet Maiden), Atargatis (The First Mermaid), Leucosia (The White Light), Raidne (Improvement), and Thelexpeia (The Martyr), all sirens featured prominently in Greek and Mesopotamian mythology.